Welcome to Brad's online memory archives. It was another blissful day of vacation. I slept late, then did a bunch of laundry, then went to Walmart to order new contacts. These are all things I have trouble doing when school is happening because there’s so little time. In the evening, I went to Bible study. It was relaxed and fun, and I wasn’t at all worried about getting to bed. Meanwhile, Gus was lazing around all day. The air has been really cool the last couple of days. 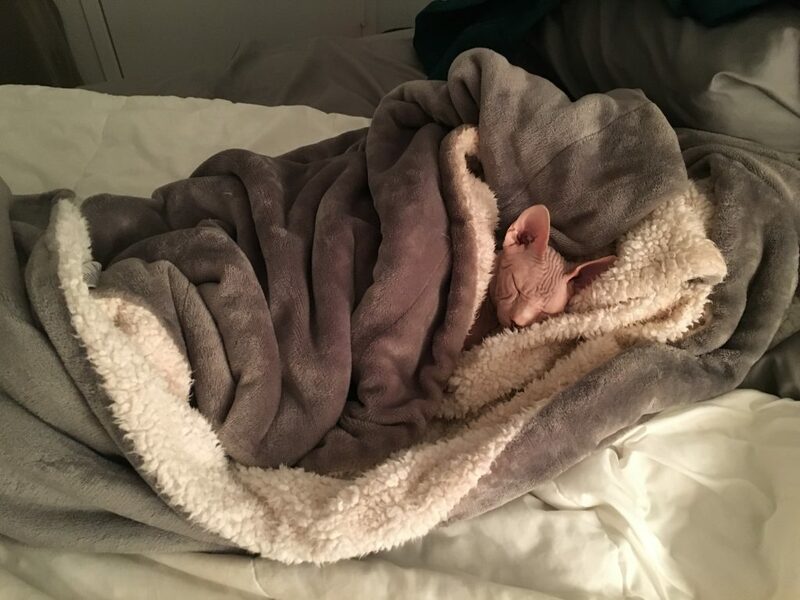 I think he likes that, because then he can wrap up in his blanket. This entry was posted in Cat. Bookmark the permalink. Now THAT is truly adorable! Gus, you need to get that contract with Cat-mopolitan magazine, get the big paycheck for modeling, and support your human! Glad you are not flying to B’more today; weather report sounds not conducive to safe flying or landing. Should be all over by the time you hit BWI on Friday, though. Safe journey. Awwww…. that looks like the happiest cat ever. Heck, the happiest living thing! Gus is living my life goal. The question: “if you could be an animal what animal would you be?”I always say cat, just because of all those naps!